Chirag sends Disha to a funny looking guy. His name is also Chirag. Disha introduces herself and chats with him. He asks for dance. She hesitantly says okay. He dances funnily with her and Chirag laughs. His friend comes to him and asks why he’s smiling. He tells her how he sent Disha to another Chirag. His friend goes to waiter and says not to give anyone entry without a drink. Ranvir and Ishaani arrive there. Ranvir checks out the girls. They have their usual nok-jok. Ranvir receives a call and goes outside. Chirag’s friend comes to Ishaani and tells her no entry without drink. She says she doesn’t drink, but he forcefully tries to make her drink. Ranvir sees it and comes back to defend her, but she asks him to stay back. She will handle it. Chirag’s friend says, good girl, and makes her drink again. She slaps him and he falls down. All come there. Chirag asks what’s happening. 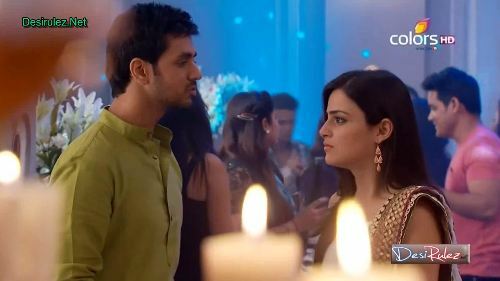 Ishaani says who are you? He says he’s giving this party. Disha is shocked finding out he’s the real Chirag. 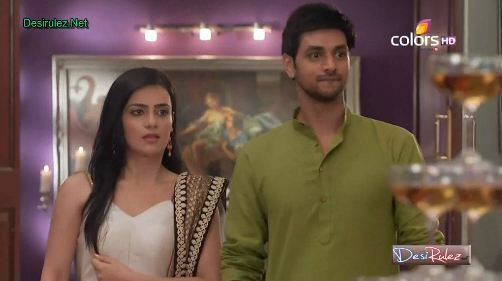 Ishaani tells Chirag his friend was forcing her to drink when she said no. They all think they’re cool if they drink, but the truth is they need nasha to enjoy their lives. She loves their life and she doesn’t need any nasha. Chirag says whatever it is, she slapped him and she’ll now apologize to him. Ranvir interrupts to cool everything down. He says he will say sorry, they are from same house, so it shouldn’t matter. 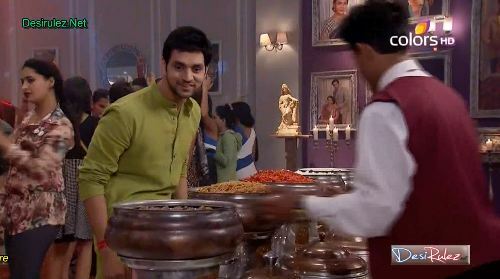 He goes to Chirag’s friend and makes him stand and apologizes. Chirag’s mood is spoiled. Other Chirag is trying to talk to Disha, but she pushes him. A waiter is passing from there. His tray flies and Chirag’s clothes get dirty. He says what is happening here and leaves. Ishaani tells Ranvir it was not her fault, why would she apologize. And why did he apologize. Ranvir says he learned from Harshad sometimes you have to apologize to solve big matters. She says she shouldn’t have come to the party and wants to go back. He tells her that her mood is spoiled, but let others enjoy the party. All will go together. There are so many lovely girls out there. 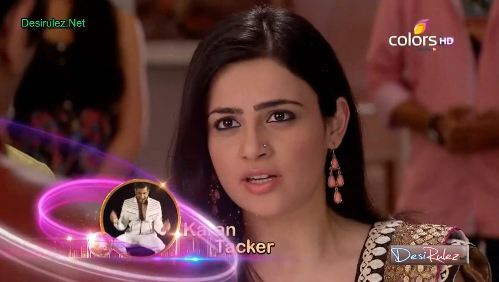 Ishaani gets irritated. He asks her to give a different look sometimes. She tells him not to eat her head. He says there is nothing in her head, he will eat something interesting. He goes to get food asking her to wait there and not to beat someone else now. He leaves. Ishaani goes to washroom. Chirag is annoyed with unnecessary drama. Prateik is looking at Ruchika’s photo. 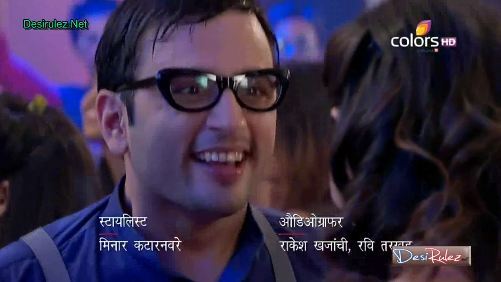 Devarsh tells him there are so many girls there and asks him to enjoy with them. Prateik is not interested. Devarsh sees Chanchal coming in and gets shocked. He understands Baa must have sent her and he decides to teach her a lesson. He tells Prateik if he doesn’t want to talk to girls, then he will introduce him to his rockstar friends. Prateik says no, but he takes him forcefully. Chanchal wonders how she will find Disha in this crowd. Devarsh drops Prateik to some gay guys and then goes away. A gay guy touches Prateik and Chanchal gets shocked. Prateik also sees her. Devarsha drops alcohol on Chanchal’s saree and hides. A waiter passes from there. Chanchal tells him if he’s blind. Devarsh drinks and dances. Chirag is changing his tshirt. He’s still annoyed with Ishaani and says first she slapped his friend and then talked so rudely with him. If she wasn’t his dad’s guest, then he would show her. Ishaani enters the same room and sees him changing. She turns and says disgusting. What kind of party this is. All manerless people. He tells her she’s mannerless that she came to his room. She says why waiter sent her here. All are mad in this house. He says, hello? not sure about all, but one is definitely mad. All girls die to meet me, but she entered to his room straight. She tells him even if he was last guy, then she wouldn’t come to see him. She has seen many like him, calling himself a rockstar. He asks if she seen everyone shirtless? She just leaves from there. Disha comes to his room now and he comes out. She tells him he’s looking nice. They go to the party and talk with each other. Chanchal sees them together and says her work is done now. 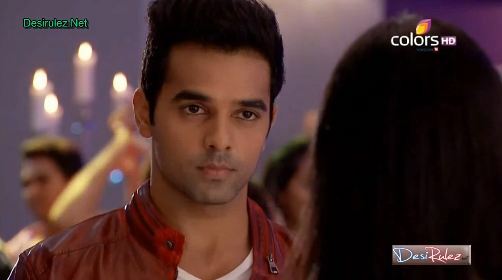 Disha asks him why he lied to her. He says there should be some fun in first meeting. He says her accent was good. She says she learned from movie. They continue their conversation. Ranvir sees food and says so much variety. He is taking it like crazy. Disha sees him and says, people like him don’t leave any opportunity. If he eats like crazy, then how would he drive? He may do car accident. Chirag says he will be back. Baa, Falguni, Harshad are having dinner. They talk about Chirag and their daughter’s alliance. Baa says they will do destination wedding. Harshad says but she doesn’t like all that. She likes everything simple. He says, Ishaani.. and Baa says Disha. He asks why disha? Baa says she’s this house’s blood, so obviously she will talk about her. Harshad says, Ishaani is also.. Baa says no, she is not your blood. She’s Falguni’s blood. She came as dowry with Falguni. Harshad tells her not to talk like that, for him, both daughters are equal. Baa says by staying in this house, she won’t become our family member, else all servants would become family members like that. She asks him not to argue with her. He says he’s not arguing, he’s just saying what he learned from her. Despite being elder, Baa educated his younger brother because he’s was sharp. She only says everyone gets what they are capable of. And here Ishaani is elder and capable as well, so it’s her right. Baa says her promise matters more than Ishaani’s right, and she has promised Disha about her alliance with Chirag. She leaves. Falguni looks at Harshad. Precap: Ishaani fights with Chirag for Ranvir.